Antithesis - ZineWiki - the history and culture of zines, independent media and the small press. Antithesis is a science fiction and fantasy fanzine published by Chris Sherman. 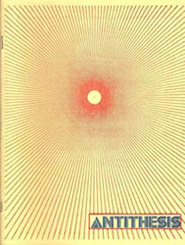 Antithesis was published in Minneapolis, Minnesota, U.S.A. in the 1970s. The first issue appeared in December 1973, and subsequent issues in 1974. The fanzine included articles, essays, fiction, poetry, artwork, and letters. Contributors of art work included Dan Akin, John Banks, Sheryl Birkhead (The National Fantasy Fan), Karen Burgett, Al Cox, Jim Faulkenberg, Eric Mayer (Groggy), Richard Olsen, Brad Parks, Jim Pianfetti, Jim Pitts, Steve Riley, Mike Scott, Chris Sherman, and Joe West. The cover was by Wendy Victor. Contributors of writing included "A Day In the Life of Sheryl Birkhead" by Sheryl Birkhead, William Breiding (Star Fire), C.C. Clingan (The Diversifier), Stanisslaus Clutchpin, Llewellyn M. Cabo on "Continuing the Cthulhu Mythos", Don D'Ammassa (Mythologies), Leigh Edmonds (Rataplan), Warren J. Johnson, Joe Photographer, Chris Sherman, Roger D. Sween, Richard L. Tierney, and Kevin Williams. Chris Sherman also published Abraxas and co-published the one-shot zine TerVex with Loren Joseph MacGregor. In 1974, he founded APA-50 (The Amateur Press Association of 1950). This page was last modified on 12 June 2012, at 13:21.